I have posted a number of articles on this blog about lyric writing that include advice from famous lyricists about the use of rhyme. It is well worth checking all of the posts with the tag / keyword ‘rhyme’. This post is a short set of notes I made from reading: Lennard, John ‘Introduction (2005)’ in New Oxford Rhyming Dictionary , 2006 / 2012, OUP, ix-xxxii . My bulleted points are just my own shorthand notes working through his article. He includes excellent descriptions of different varieties of rhyme, and it is worth going to the book itself to read his Introduction. 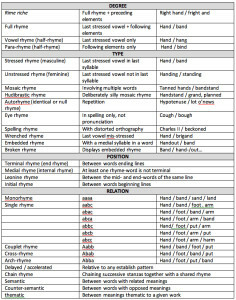 He very usefully created a table that he called ‘The varieties of rhyme’ that I have added as a picture at the end of this post – this is well worth studying closely, and keeping as a reference tool. relation (single, cross, arch, accelerated, chain). There are also semantic, counter-semantic and thematic.